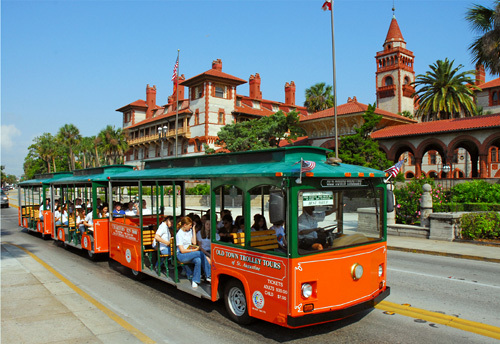 Offered by Historic Tours of America, the St. Augustine Hop-on Hop-off Sightseeing Tour lets guests enjoy a guided tour of the St. Augustine area at their own pace, led by experienced Old Town Trolley conductors. The 80-minute tour features 23 stops and more than 100 points of interest, including the Fountain of Youth, Lightner Museum, Flagler College, the St. Augustine History Museum, and more. Sit back as our talented Old Town Trolley conductors share the history, attractions and sights of America's oldest city. Founded by Pedro Menendez de Aviles in 1565, St. Augustine is a unique city filled with colonial Spanish neighborhoods, magnificent buildings and a charm all its own. The "80 minute tour" features 23 stops and over 100 points of interest. Unlimited use of the Old Town Trolley and St Augustine Beach Bus. See and Visit... Fountain of Youth, Lightner Museum, Castillo de San Marcos, Ripley's "Believe it or Not", Flagler College, St. George Street, St Augustine's Oldest House, St. Augustine History Museum, the Old Jail and much more! Tour at your own pace! Old Town Trolley Tours allows you to get off at any of our convenient stops situated close to all popular attractions, shops and restaurants. When you're ready, just re-board and it's on with the tour. Additionally, the Old Town Trolley pass is good for admission to the St. Augustine History Museum , and the St. Augustine Beach Bus with hourly shuttle service to St. Augustine Beach, Anastasia Island, and Downtown St. Augustine. What does your tour consist of and how long does it take? 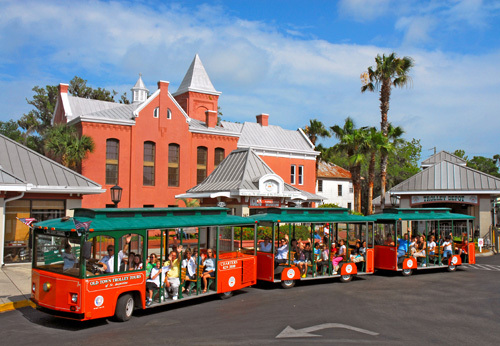 The Old Town Trolley Tour is a 70 minute, narrated historic tour of downtown St Augustine. The trolley tour features 23 stops where guests can get on and off to shop, dine or sightsee. We cover 100 points of interest during our tour. Your ticket is good for three consecutive days and includes FREE admission to St. Augustine History Museum. Our expert guides are licensed by the city and extensively trained. How often do the trolleys come to each stop? Our Trolleys come by every 15 to 20 minutes, though times may vary slightly due to traffic conditions. Our Old Town Trolley depot is located at 167 San Marco Avenue at the Authentic Old Jail, just north of downtown. There is plenty of free parking here. What is at each trolley stop? #1 – The Old Jail, St. Augustine History Museum, Gator Bob’s Trading Post, Oldest Store Museum Experience, Free Parking. #19 – Ripley’s Believe it or Not! Are the trolleys handicap accessible? Yes, we do have two wheelchair accessible trolleys. A person needing these trolleys can only board and exit the trolley at our main depot. Call in advance to see what time the handicap accessible trolley departs. The last tour of the day is at 4:30 P.M. from the Authentic Old Jail. Can I bring my stroller on board the trolley? Are dogs allowed on your trolleys? Assistance animals, such as seeing-eye dogs, are the only animals that are allowed on board the trolleys.